Laurie Sokoloff was born into one of Philadelphia’s leading musical families. Both her parents were on the piano faculty of the prestigious Curtis Institute of Music. At age fourteen, she was accepted into the program at the Curtis Institute, where she studied with William Kincaid, former principal flute of the Philadelphia Orchestra. By the time she graduated at age eighteen, she was al ready the contracted piccoloist with Philadelphia’s two opera companies and the Pennsylvania Ballet. During the years spent in Philadelphia following her graduation, Ms. Sokoloff performed in chamber music recitals with cellist Jay Humestan and pianist Peter Serkin, soloed with the Philadelphia Orchestra (Chaminade Flute Concerto), and played numerous recitals with her father, pianist Vladimir Sokoloff as well as gave chamber music recitals for the Bay Chamber Concerts in Rockport, Maine. 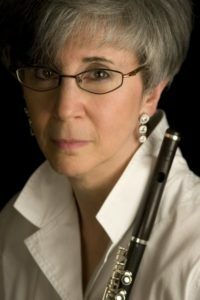 Ms. Sokoloff has just retired from the Baltimore Symphony Orchestra, where she has performed as solo piccolo since 1969. She has been featured soloist with the orchestra performing concerti by Vivaldi and Liebermann. 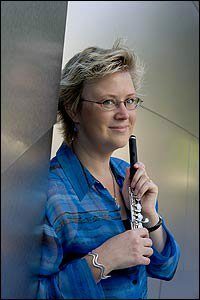 She has given piccolo master classes at the Peabody Conservatory and the Curtis Institute of Music and currently teaches flute and piccolo at Peabody. For several years, she was the chairperson of the National Flute Association’s Piccolo Committee and also Coordinator of their Piccolo Artist Competition. Working for the NFA she spearheaded commissioning the Liebermann Piccolo Concerto and Souvenirs by Robert Beaser. In the summer of 2000, she premiered a piece written for her by Michael Daugherty at the National Flute Association Convention. In August of 2017, the NFA will award her their Lifetime Achievement Award at the Convention in Minneapolis. Peter Verhoyen is principal piccolo of the Royal Flanders Philharmonic Orchestra (chief conductor Edo De Waart and principal conductor Philippe Herreweghe). He is a prize-winner in the Belfius Classics competiton and the Concours International UFAM in Paris. He was also a semi-finalist in the NF A Orlando Young Artists’ Competition in 1995. He commissioned several works for piccolo from Flemish composers, most of which have been recorded. His piccolo recital cd’s Piccolo Tunes, The Birds!, Piccolo Polkas, Psychobird, La Gazza Ladra with pianist Stefan de Schepper established his reputation as a piccolo specialist.Peter was invited to give masterclasses and concerts in conservatories in Belgium, Europe and the United States : Brussels (Royal Conservatory), Enschede (Artez Hogeschool), Brno (Janacek Academy), Paris (CNSMP), Omaha (International Piccolo Symposium), London (Royal Academy), Oxford (Flute Summer School), Weimar (Hochschule für Musik Franz Liszt). He has given piccolo recitals at the BFS Convention in Warwick (UK) and the NFA Conventions in New York, Las Vegas, Washington and San Diego (USA). With his chamber music ensemble Arco Baleno, he realized fifteen cd projects as well as various radio recordings. Arco Baleno toured Germany, France, Slovenia, the USA and the Netherlands after winning the CHAIN-contest in Enschede (The Netherlands) and the Musical Youth Debut Prize for chamber music. 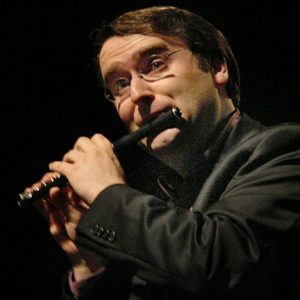 Peter currently teaches at the Royal Flemish Conservatoire in Antwerp, where he developed a piccolo master program, and at his private flute studio in Bruges. In cooperation with Aldo Baerten and Robert Pot Peter organizes the International Flute Seminar Bruges. Sarah Jackson has held the position of Piccolo for the Los Angeles Philharmonic since 2003. Prior to this, in 1993, she joined the Vancouver Symphony Orchestra (British Columbia, Canada) as Second Flute. Ms. Jackson then moved on to take the position of Assistant Principal Flute and Piccolo with the VSO. Ms. Jackson also taught flute and piccolo at the University of British Columbia. Sarah Jackson is a much sought after piccolo and flute teacher, and she attracts students from around the world. She has taught, led masterclasses, and performed recitals in Italy, Japan, France, United Kingdom, Czech Republic, Belgium, Netherlands, Venezuela, Hong Kong, Canada, and the United States. Sarah is also an active chamber musician, soloist, clinician, and freelance artist, and has played for numerous films, CD recordings, and TV and radio broadcasts. Sarah received her Bachelor of Music Degree in Flute Performance from the University of British Columbia in Vancouver. In addition to taking private voice lessons, she specialized in flute and piccolo, studying with Camille Churchfield, former Principal Flute with the Vancouver Symphony. Sarah attended McGill University in Montreal, Quebec for Graduate Studies with Timothy Hutchins, Principal Flute of the Montreal Symphony. While studying there, she auditioned for and won her first professional position as 2nd Flute with the Vancouver Symphony Orchestra. Rena Urso enjoys a flourishing career as a freelance orchestral and chamber musician all over California. 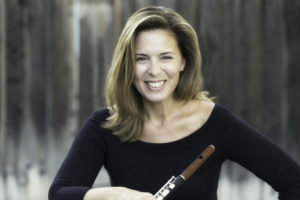 In addition to being a member of the flute faculty at the Bob Cole Conservatory of Music at California State University Long Beach, she holds the positions of Second Flute of the Oakland Symphony, Second Flute and Piccolo of the San Francisco Opera Center Orchestra, and Second Flute of the Oregon Coast Music Festival Orchestra. She previously held Piccolo positions and toured extensively with the New York City Opera National Company and San Francisco Opera’s Western Opera Theater. Ms. Urso regularly performs with many of the orchestras throughout California including the San Francisco Opera, Pacific Symphony, Los Angeles Chamber Orchestra, Santa Barbara Chamber Orchestra, Monterey, Marin, Santa Rosa and Long Beach Symphonies, Carmel Bach Festival, and Festival Mozaic. She has also performed with the Seattle Symphony, American Ballet Theater, Bolshoi Ballet, Mark Morris Dance Group, Hawaii Symphony, and the Detroit Symphony Orchestra. As a Licensed Andover Educator (Body Mapping Instructor), she presents clinics and masterclasses across the US. Recent engagements include the Juilliard School, Manhattan School of Music, SUNY Stony Brook, Rutgers University, the Butler School of Music at the University of Texas Austin, Roosevelt University, and many of the other Schools of Music within the California State University system. Additionally, Ms. Urso is a Course Coordinator for California State University Summer Arts as well as a frequent guest artist at the Iowa Flute and Piccolo Intensive summer courses. A native of Detroit, Michigan, Ms. Urso received her Bachelor of Music from Wayne State University, and her Master of Music with honors from California State University Long Beach. Her principal teachers include Robert Patrick, Clement Barone Jr., John Barcellona, Anne Diener-Zentner, and her father, Santo Urso.